Large windows let in a multitude of light in Jennifer of Decorated Chaos’s living room, which made the area uncomfortable to live in on sunny days. Replacing her mini blinds with bamboo shades not only fixed her sunny day problems, but added a beautiful finishing touch to her living room. Jennifer’s unique style and creativity created Decorated Chaos as an outlet from her corporate life by day and a way to meet like minded people. She loves thrifting and crafting which produces a lot of fun, DIY projects on her blog. Old mini blinds were bringing down the mood of Jennifer’s living room and didn’t serve her needs. Instead of covering these big windows with drapes that would block a majority of the light to come in the room, Jennifer wanted a window covering that would allow her to let in light without losing privacy. The color and texture of the blinds add warmth and allow me the flexibility of having a fully opened window where the light can shine in, or a fully covered window for those times when I want privacy. She swapped out the mini blinds for Budget Woven Wood Shades in Malay Umber which beautifully filter light. I chose the Malay Umber color for several reasons. It has various shades of brown in it and some random flecks of black, so the pattern is very random and shows off the natural bamboo. I also thought the warm shades of brown complimented my wall color and flooring too. I have white trim with soft creamy yellow walls so I didn’t want something too light that would blend in but yet I didn’t want something that contrasted too much and looked too busy. So the Malay Umber was the perfect choice for my front room! Jennifer chose to add an optional liner to her shades to ensure nighttime privacy. These shades are also available with blackout liners and in 40+ woven wood patterns. The bamboo slats vary in size and allow a little light to shine trough, which I completely love for the day time. However, at night I wanted the option of having privacy so my design consultant suggested that I add a privacy liner to the back. The privacy liner you see here is a white fabric backing that gives you full coverage when needed. I am so glad I chose this option! 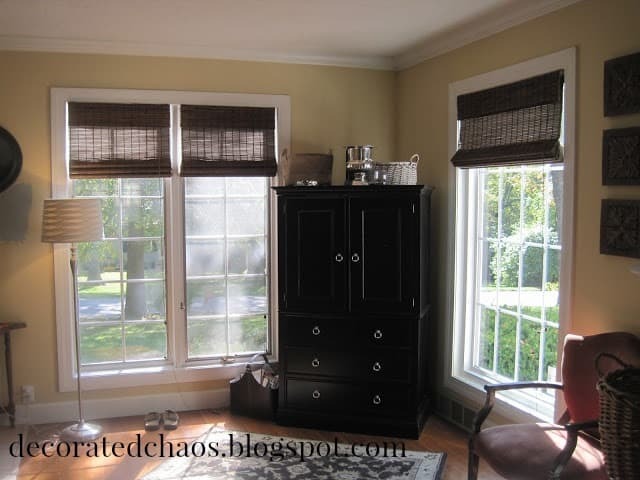 See more of Jennifer’s front room makeover in her post, New Bamboo Shades from Blinds.com. Jennifer selected Blinds.com Woven Wood Shades in Malay Umber with an attached privacy liner. Did you know that you can get an independently movable liner for the same price as the attached? Learn more in this post: The Woven Wood Feature You’ll Wish You Had.